We are officially in the home stretch—the first day of Spring is coming up in a few weeks on Sunday, March 20! After last winter, I am sure there are no complaints from anyone in Boston! With all of the great beaches and harbors we have here in New England, you cannot (or naut, as the case may be) go wrong with nautical inspiration for all things Spring! Here are my top three favorite nautical trends as you prepare to top your table, travel and take the town this season! Nautically-themed Showers and Spring Galas are always fresh and fashionable. 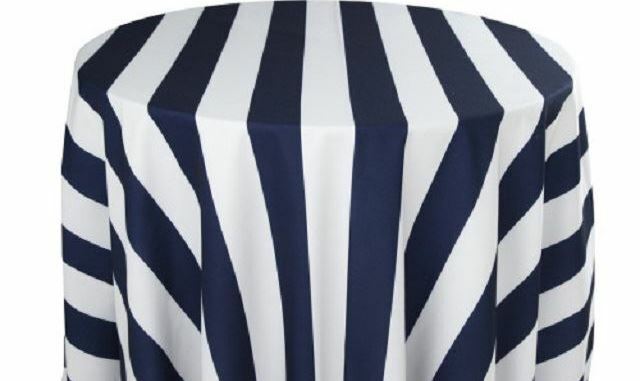 When styling these, my go-to linen is ALWAYS the liberty stripe navy and white from my friends at Rentals Unlimited! This clean and classic linen also looks great with accents of this season’s popular coral, teal and yellow palettes! Great bags are “my thing”, and I especially love any bag that can be personalized! Sea Bags from Maine http://seabags.com/custom.html are durable, green, and come in a variety of sizes! In addition to their current spring selections, these can be customized with a wedding date (perfect for a Bride-to-Be heading to Nantucket for a bachelorette party), monogram (a fabulous gift for bridesmaids) or can have your own design uploaded and interpreted by their graphic team for a one-of-a-kind beach or travel tote. Photo courtesy of Rentals Unlimited.